Garage doors are generally hardy and long lasting, but there are a few things that can damage them either slowly and over time, or fairly quickly. So if you have or are looking to get one installed, there are a few things you should know about the effective upkeep that they need, and the kind of conditions they should be kept in if you want them to continue operating as well as they can and for as long as they can. One of the first things to watch out for is the severe damage that can be caused to the door and other parts of your system, is the weather. Regardless of what material your doors are made of, they will take a battering by the atmosphere if they are not properly treated and maintained. Wooden doors that are uncoated will rot quickly, especially if you live in a damp climate. Keeping them painted or varnished will keep this from happening, and should be done again each year if you wish to avoid the need for door repairs. The same is true for alloy doors that are made of metal or iron. Untreated metals will rot, and are more vulnerable in damp climates where the air has an acidic effect on the door. The garage door springs, tracks and cables are not built to last forever, and will start to crack under pressure after a few years of use. When these are damaged, the danger of your system becoming inoperable is not the worst of your fears, but the damages that they can cause to the doors and your other property like cars and the garage itself, probably is. 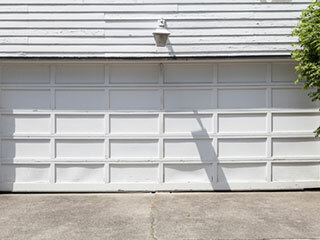 A sturdy garage door can be destroyed fairly easily by backing into it with a car, and the parts will almost certainly wear down if they are over used. If your door has been damaged by an accident, there is always the chance that a simple bout of professional garage door adjustment will get it back in working order. Remember that if any door slats needs to be replaced, they should be properly coated and treated to avoid the damaging effects of the weather. If any of the smaller parts of the system have started malfunctioning, rusting, cracking or making unusual sounds, it is probably in your best interest to get them seen-to quickly, before they cause further, more expensive damages. Keep a close eye on these parts for rust or cracks, and if you spot anything out of the ordinary, call a technician for emergency part replacement. Remember, it is always better to be safe than sorry!